Above is an image I’m sure that, if you clicked on this post with the intent to read it, you’ve seen plastered all over the internet the last few days. 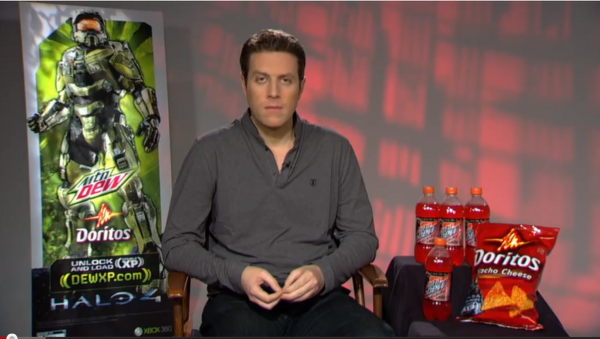 It features Geoff Keighley, one of the most prominent video game journalists, sitting around obvious blatant advertisements. I realize that I’m beating a dead horse here. Do I think that I’m going to be able to give a fresh and interesting take on this topic that has gripped the video game industry lately? I’m not sure. Probably not. Out of all the aspiring and current video games journalists out there, I’m probably the least qualified to do any talking about the state of it or what it takes or means to be one. Many of you probably read the title to this post and rolled your eyes. And you have every right to. The last three or four days that I’ve been posting on this blog, I’ve simply been regurgitating information that other journalists have discovered, or announced, or reported. What could I, someone who’s never received a review copy of a game, who’s never been to E3, or any game conference for that matter, possibly hope to add to this already wrung out conversation? The controversy, for those who aren’t aware, is that this Keighley is regarded as a video games journalist, and yet this picture clearly shows him engaging in very un-journalistic activities. Shouldn’t someone who people rely on in order to give themselves information about video games, their developers, the industry as a whole, separate himself in order to try and keep himself from biases? Of course, nothing you’ve ever read has been void of biases. That’s just human nature. No matter what, we always have our subconscious trying to persuade us one way or the other. But there’s been a trend in video game journalism lately, and some would argue, has always been there, where the journalistic integrity of some who claim to be journalists has been questioned, or outright removed. I’m a Journalism student at the Ohio University E.W. Scripps School of Journalism. It’s an accredited school, one of the best in the country. The reason I went to this school was because I wanted to study journalism. The reason I want to study journalism is because one day I hope to become a video game journalist. These last few blog posts have documented my very tentative dip in the pool that is the video game journalism industry. But what it means to be a video game journalist seems to have some people confused, most of all me. Journalism, I’ve learned in various classes, is the pursuit of truth, at it’s most basic. As a journalist, your job is to get the facts and report them to your audience with as little bias and as much objectivity as possible. It’s a noble profession, I’ve been told, one that I should be excited to join and is constantly changing every day. Video Game Journalism, on the other hand, can be harder to define. For some people, they don’t even consider themselves journalists. They are video game enthusiasts, who enjoy writing. Others see themselves as consumer journalists, whose only purpose is to tell their readers what game they should buy, and when, and which they should avoid. Game journalist: n – An individual who writes professionally about computer and video games, although may not adhere to a professional work ethic. May not research or fact-check stories. May be more interested in hyperbole than actual constructive criticism of media. May be incapable of determining the mathematical average of a 0-to-10 scale. May be unable to handle criticism. May claim to be “just a blogger” or “not a journalist really”, which is at least partially true. See also: Game PR. And for more and more people, that definition is beginning to ring true, especially in these last few days. Now, I know what you’re thinking. “Who are you to criticize these people? You don’t know what they’ve gone through! You don’t know what their lives are like! You might do the same in their position!” And you’re right, I have no justification. I am woefully unequipped to deal with ethical questions of this size. When Borderlands 2 was released, the Wall Street Journal, one of the world’s most respected newspapers, released a review that was to many, an absolute joke. “This is a bad article and you should feel bad. I feel bad for giving you a click,” said one commenter. “Hahahaha! You don’t knowanything about video games, do you? This is a horrid article. Nice face, btw. You should probably take that off of future poorly written articles,” said another. And it’s true, the journalist might have benefitted from doing a little more research into the game. But he represents the other end of the spectrum, I think. Why should this man be ridiculed for not enjoying the game? Sure his article was angled in a very weird fashion, but some of the points he brings are are valid, and are even mirrored in other reviews on respected games websites. With the migration of journalism to the web, it’s getting easier and easier to set yourself up as a journalist (case in point, see this blog.) I think that the few shining stars out there who hold their staff to a certain journalistic integrity will eventually emerge as the industry leaders, while those who blatantly disregard any respect for journalism will fall by the wayside. For more information on this topic, I highly recommend these articles, which do a much better job on covering the topic than I do. im proud of you, youre on your way. one step further than your peers. AND WITH TALENT! OH MY!